Blessed Mother's Immaculate Love for the Wild Soul Have You Forgotten? I Am Your Mother. You Are Under My Protection. There is a promise Holy Mother makes to us, proclaims Dr. Clarissa Pinkola Estes, that any soul needing comfort, vision, guidance, or strength can cry out to her, flee to her protection, and Blessed Mother will immediately arrive with veils flying. She will place us under her mantle for refuge, and give us the warmth of her most compassionate touch, and strong guidance about how to go by the soul's lights. 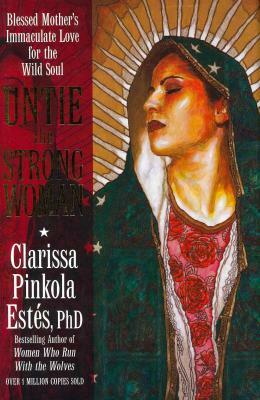 "Untie the Strong Woman" is Dr. Estes invitation to come together under the shelter of The Mother whether she appears to us as the Madonna, Our Lady of Guadalupe, or any one of her countless incarnations. In this unforgettable collection of stories, prayers, and blessings, Dr. Estes shares: The Drunkard and the Lady a story of unexpected miracles that arise from the mud and soil Guadalupe is a Girl Gang Leader in Heaven a poem of resistance and hope No One Too Bad, Too Mean, or Too Hopeless the fierce Mother that never gives up on us The Shirt of Arrows a love that is invincible no matter how many times we are wounded The Black Madonna she who stands at the juncture between two worlds and protects us as we enter the dark places Why does the face of Our Lady appear in the most humble and unexpected places? Why does she burst forth into every culture no matter how hard authority tries to suppress her? It is because no bonds can restrain the power of her love, nor prevent her from returning to those who need her most. With "Untie the Strong Woman," Dr. Estes invites you to encounter the force of Immaculate Love So that your memory of Her is renewed, or that the knowledge of her miraculous, fierce, enduring ways is drawn into your heart for the very first time. Contents First Words"Our Ancestral Great Mother" Opening Blessing: Totus Tuus, I Belong to You, Blessed Mother Chapter Two"How the Great Woman Was Erased: Our Part in Restoring Her" Untie the Strong Woman Chapter Three"She Is the Inspiratus for Souls Who Suffer" The Drunkard and the Lady Chapter Four"In Humble, Helpless Love with Her" Guadalupe Is a Girl Gang Leader in Heaven Chapter Five"Rise Up Even From Bloodshed, Says La Conquista, Our Lady of the Conquered" Massacre of the Dreamers: The Maiz Mother Chapter Six" Shirt of Arrows: She Teaches Protection of the Vulnerable: No Exceptions" The Memorare, Remember Chapter Seven"The Uses of Broken-Heartedness, Mater Dolorosa Ever Bends Near " The Use of the Seven Swords Through the Heart Chapter Eight"Many Kinds of Prisons: The Last Woman Standing " Our Lady Behind the Wall Chapter Nine"Carrying the Name of the Mother" A Man Named Mary Chapter Ten"Forged in the Fiery Furnace" The Black Madonna Chapter Eleven"No One Too Bad, Too Mean, or Too Hopeless" How the Motherfuckers Became the Blessed Mothers Chapter Twelve"No Racism, No Discrimination, No One Is An Untouchable " The Great Woman Appears to Us Daily Chapter Thirteen"Her Names Without Classic" Litany of the Mother Road: Chant of Her Incandescent Names Chapter Fourteen"Compassionate Mother: Restoring The Soul After Shock" Post-Abortion Compassion: The Children She Got That She Did Not Get Chapter Fifteen"The Lasso of Our Lady For Saving a Life" The Drowning Man Chapter Sixteen"Holding Fast to the Soul" God Has No Hands: Comforting Maria, The Ritual of Pesame Chapter Seventeen"The Great Mother Inspires the Little Mothers" The Marys of Mother Africa Chapter Eighteen"Refusing the Holy: No Room for You Here" The Oh Yes, There Is Too Room for You Here Ritual of La Posada Chapter Nineteen"Letter to the Young Mystics Following Holy Mother" Our Lady of Guadalupe: The Path of the Broken Heart Chapter Twenty"Los Inmigrantes, We Are All Immigrants: " "The Undousable Creative Fire" They Tried to Stop Her At the Border Chapter Twenty-One"Mi Madre, Tu Madre, La Madre de Ella, La Madre de El, Nuestra Madre: My Mother, Your Mother, Her Mother, His Mother, Our Mother" The Truth About How Very Hard it is to Get Into Heaven Chapter Twenty-Two"That You Be Watched Over and Kept Safe Until We See Each Other Again" Closing Blessing: Have You Forgotten? I Am Your Mother Chapter Twenty-Three"Beautiful Words About the Mother" Some of the Ways Other Creative Souls Understand Relationship With Mother Chapter Twenty-Four"Aymen, Aymen, Aymen And A Little Woman" The Highest Prayer. Clarissa Pinkola EstesClarissa Pinkola Estes, PhD, is an internationally recognized scholar, award-winning poet, diplomate senior Jungian psychoanalyst, and "cantadora" (keeper of the old stories in the Latina tradition). In addition to her international bestseller "Women Who Run With the Wolves," Dr. Estes is a managing editor and columnist writing on politics, spirituality, and culture at the newsblog TheModerateVoice.com, and she is a columnist at "The National Catholic Reporter" online."